I have never owned a new car before. I mean “really new.” My new Camry L had only 25 miles when I drove it off the lot. I have had it almost 5 months, and have had it “professionally” washed two times. (See my first review several months ago.) For the most part, I have washed it myself but for some reason the birds are attracted to the sky blue color, and this time I could not reach the middle of the roof when it was splattered by bird feces when I parked under a tree to keep the car cool. OK – dumb. But…the car was cooler than if I hadn’t parked under the tree; and the bird droppings didn’t bake on to the roof like it might have if it was out in the sun. OK – you are right. It was dumb. 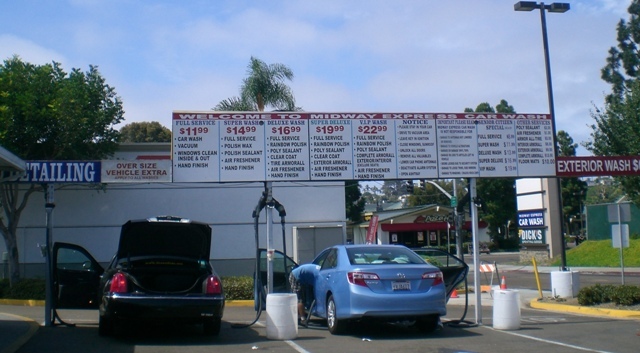 I decided to take the car to the “Midway Express Car Wash” because there are three car washes in the area that I wanted to try. (The first one was “The Auto Scrubber” on Rosecrans. See the first review.) My neighbor told me he ALWAYS takes the car to Midway so since I was on my way to shop at Ralph’s it was a natural to stop in on Tuesday, August 21. It was 10:55am and I was surprised that it was not very busy. In fact, there was one car going through the car wash; there was one car that was being vacuumed, and then there was my car. I was a little taken aback when the service person said to me, “ . . . ok honey, just pull it ahead a little bit more.” I did and wondered if he called everyone “honey.” Unfortunately no one else came into the car wash while I was there so I did not hear how he greeted others. After looking over the various prices of things to do to my car, I decided to have a “full service wash” because that was what I had at Auto Scrubber. The sign stated it was $11.95, which was comparable to the Auto Scrubber for the same service, so I was surprised when I was only charged $8.99. When I looked at my receipt, I found I was charged a “senior citizen price.” (I guess I have passed the point when I am asked, “ . . . do you qualify for the senior citizen discount.” DAMN! The car was vacuumed inside and the trunk was popped open so that it could be vacuumed also. Then it was whisked away to go for its bath. (I pulled up at the vacuum section at 10:55am; at 11:02am the car came out of the washing area. )I do not know if the floor mats were removed to be vacuumed or if they were just vacuumed as they lay on the floor. (One of the complaints I had about the Auto Scrubber was that the floor mats were removed but were not locked back in when they were placed back in the car. This a Toyota, for goodness sake, and there has been a great deal of publicity about the floor mats the cause of a California Highway Patrolman’s death.) Because they were not busy, 4 men wiped it down inside and out; the trunk was again popped open, and one of the men made sure to wipe the rims of the trunk lid. The car was completed by 11:07am. Over all, I have to say that I was more pleased with the finished product at the Midway Express Car Wash than I was with the Auto Scrubber. The car seemed cleaner; there was easy access to the vacuums; the people working there were pleasant, and it was not overly crowded. I was not asked if I wanted an air freshener nor was one used. (At the Auto Scrubber the odor was so strong that I had to drive with the windows open to get rid of the smell. The only downer that I could find was that there is still construction going on where the old Ralph’s used to be. From a distance, I could see dust clouds being kicked into the air by the heavy equipment that was moving dirt from one area to another. However, I think that the construction will soon be over, and, granted, it was a long way away from the car wash, and should not pose a problem in the near future. I would be upset to think that the dust from the construction site was being blown over to the wet car. I used to take my car to Midway Express Car Wash occasionally. The last time, I asked for the Full Service Wash. I was told that it would be an extra $5.00 because the car was dirty. Of course the car was dirty, that’s why I took it to the car wash. DUH! I will never go back there again. I’ve never had good luck at this car wash. Always seems to be still dirty after they finish with it. I’ve never had a problem at the Auto Scrubber on Rosecrans (next to Chevron). OB Suds seems to be timed so no matter what you only get 3/4 of the car rinsed and it shuts off. The vacuums are really feeble. Most amazing is the state of corrosion of the structure, I can’t believe it hasn’t been condemned. Next time you’re there look at the steel beams on the west wall, they’re almost all gone. Seems like about a 5.5 earthquake would topple that concrete wall right onto the apartments next door. My ex girlfriend lived there about 15 years ago, would have been a fitting end if she lived there now and it did.